We get all the usual pro-spec PRS traits: great build, feel, function and sound. Faultless build and function with added resonance. Great 'working man's' vibe. Not everyone will want to pay £2,000 for a 'plain Jane' guitar. Unlike the hybrid design features of the Soapbar, this Standard Satin is identical to the High-Gloss models except for the finish and the birds-only inlays. The vintage mahogany finish again avoids being too flat in both texture and colouration and is less plain looking than a natural-finish mahogany. It has to be said that there's no room for error with this finish and the slightest scratch or abrasion mark would be highly evident. The workmanship on the guitar is precise and smooth, though, and shouldn't be confused with, we have to say, the almost brushed-on look of Gibson's satin Faded finish. The overall look is extremely classy. PRS prides itself on thin finishes but this Satin is the thinnest of all. Sometimes a thicker finish can tone down an over crisp resonance but here resonance and detail are more than apparent. The 24-fret Standard with its long neck (oddly the smoothest of the trio), vibrato, different pickups and selections gives a modern but highly versatile flavour. There a little more grind from the HFS, less vintage-like wood if you like, and more power from the Vintage Bass. There's contrast between the full on humbuckers and the single-coil splits sound a little spiky, but arguably they give a little extra edge for effected tones. Judging by the endless number of artists choosing decidedly un-posh old guitars to ply their craft these days, PRS's Satin Series seems well timed. In these all-mahogany formats they not only revisit, in spirit, Paul Reed Smith's hand-made pre-factory guitars before he started utilising curly maple but also one of his tonal benchmarks: the late fifties/early sixties all-mahogany Les Paul Juniors, Specials and SGs. But the Satins do raise some points for debate. There are limited colour choices, especially on these all-mahogany models. Some of us would prefer an actual £399 price reduction and just moon or dot inlays, not birds. The slightly textured finish, especially on the necks, might bother some players and one wonders if a quick rub with fine abrasive paper and steel wool, just to the necks, wouldn't increase desirability. Some players may simply perceive the finish as "too cheap" on a £2,000 guitar. 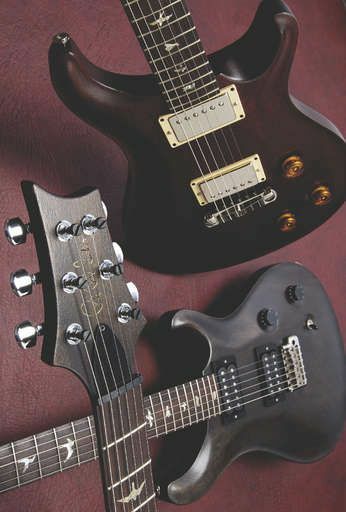 However, the Satins remain the most cost-effective PRS set-neck guitars, especially these all-mahogany models.